During the Journey through Egypt intensives we look at each region of Egypt from six different viewpoints, seeking to organize the information into six “jigsaw puzzles” on six different tables. Last week we viewed a video that showed the more informal homestyle tahtib with a “play” aspect, as well as a video showing the training of a child learning homestyle tahtib interspersed with raqs assaya (dancing with the stick). The blog the week before introduced tahtib with it’s 3300+ year history, video was included that showed a serious tahtib martial arts contest. All were accompanied by a mizmar band, all were improvisation within a mutually understood repertoire of “assaya” swings, hits, fakes, and defense. We now address tahtib representation in the next of the Tables: Local Professionals. In the next weeks we will visit Table 3: Local Regional Governorate Troupes, Table 4: Reda Troupe, Table 5: Al Firqah Al Kowmeyya Al Fannun Al Shaabeya (National Troupe), and Table 6: Orientale Stage. Local Professionals are people who self define as professional and receive money for performing. In this case the Sa’idi performance is for local Sa’idi people within the local aesthetics. From what I have observed, the men doing the tahtib within the tournaments are not paid entertainers. If the master of the tahtib, who holds the list of contestants and decides who fights whom, is paid (which I am told he isn’t, but he may be tipped) it is to organize the contestants, not as a performer. Absolutely the musicians who accompany the contest are professional and many are from professional, generational entertainment families, the father instructing and training the son. All of the Sa’idi Tahtib that I have observed and found on YouTube are accompanied with mizmar (usually 2 or 3) and Tabl Baladi drum. 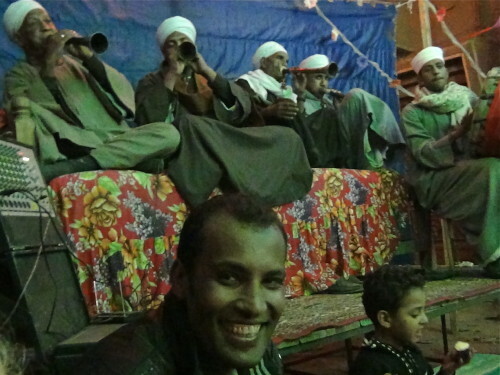 Professional mizmar band videotaped in Luxor, Upper Egypt. Video by Sahra, June 2013. In 2009 I took a group for Journey through Egypt 4 – Upper Egypt. I asked Khyriyya Mazin (a sister of the Banat Mazin of Luxor) to arrange a group of musicians and two men who could do both “tahtib” and raqs assaya. They arrived at our hotel where we had rented the meeting room. To compare the “street” tahtib with the “stage” tahtib: the biggest difference I felt was when the two Folkloric dancers did the “stage” tahtib it was a danced, staged, reference to tahtib. In comparison, the homestyle “street” is an improvised contest of wits and ability. Another difference I have observed is that all the homestyle contests I have seen were accompanied with mizmar bands. The performance done for our group was done to rababa musicians, but this could be for any number of reasons. This was the performance for Journey through Egypt 4 in Luxor, June 2009. Video by Keeth Crowhawk. Much of this JtE-4 show was videotaped, this is the 3rd video in Keeth Crowhawk’s five videos of the afternoon. You can find his series on YouTube: “Saiidi 1: musicians and dancers“ (Music & Song), Saiidi 2 (Raqs Assaya, final pose references the Tahtib), Saiidi 4: solo raqs assaya, Song, Homestyle Sa’idi indoors style). :00 Immediately views the beginning of tahtib which is the two opponents walking in a circle backwards, assaya held in the right hand pointing towards the center of the circle. :26 the swings, fakes, and defense starts. :31 Note the flow of swings and defense. :44 returns to walking backwards neutral movement. :48 Incorporation of dance-like steps. 1:15 swings and defense while on knees. 1:29 some disorganized hits, they are skirting the edge of dance and contest and fight. 1:32 one opponent presses the assaya and gets pushed away. 1:39 starts the neutral backwards walk again to start anew. 1:55 combinations of swings and dance. 2:07 becomes more of a fight. 2:58 becomes more of a fight. Have you caught the rest of our Sai’di series? Click any of the links below to read some of the other blog posts so far on this topic. In addition to more posts over the next several weeks regarding Sa’idi dance, we will also be launching a crowdfunding campaign to start up a brand new membership service run by Journey Through Egypt. The Research Program. Through the research program you will be given monthly clips from my archives, along with having a forum to discuss these videos with both myself and other dancers. Make sure to join our newsletter or follow JtE on facebook (to the left of the page) to be updated on our launch dates. We’ll have lots of first time offers, such as posters, t-shirts, custom designed Riqqs and more, so be sure to stay tuned! 2 Years later I finally found the dance leader, Mostafa Booriy, who now teaches our Sa’idi dance and assaya class for JtE-4 in Luxor.